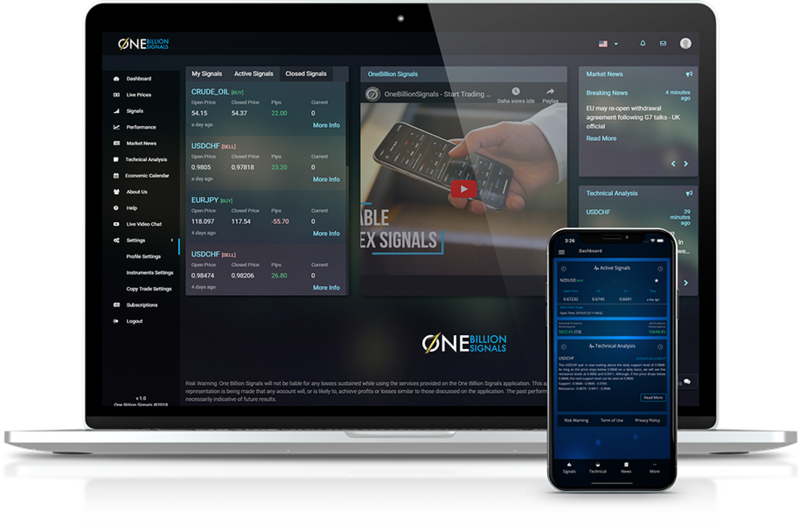 One Billion Signals is the fin-tech application with smart and easy-to-use interface that has everything you need to be successful when it comes to trading. Get information about the market and alerts on suitable investment instruments at the right moment. Collect your profit. Thank us later. The financial market can be a scary place for novices and experienced traders alike. You need to know the different financial instruments out there, as well as all the political, economic and historical factors that can affect their prices. At the same time, you have to stay updated on news from all around the globe, in order to anticipate and seize the right moment to make a move. Our solution aims at addressing that gap and helps you place trades at the right moment. OBS is an application suite, created by a team of experts that have multiple years' experience trading on the financial markets. Our cumulative knowledge made us confident enough to start advising others. The mobile and web application are a result of our joint effort to pair useful information with important daily events and deliver this in the form of filtered signals for our users. Our expertise helps us narrow down the important details among all financial and economic news worldwide and select only what really matters for your investment success. The signals we deliver have proved to be 83% accurate (and we keep raising the statistics). Besides the push notification signals, we provide a handful of other features that keep you updated with the market and make your trading decisions easier. OBS truly is a one stop shop: you get access to live prices, an economic calendar, market news and technical analysis done by our experts. The application is suitable for beginners, as it eliminates the steep learning curve - you don't have to know it all in order to be profitable - you just need to follow the signals. At the same time, you can use our app even if you're an experienced investor. It will be a time-saver in your busy day!